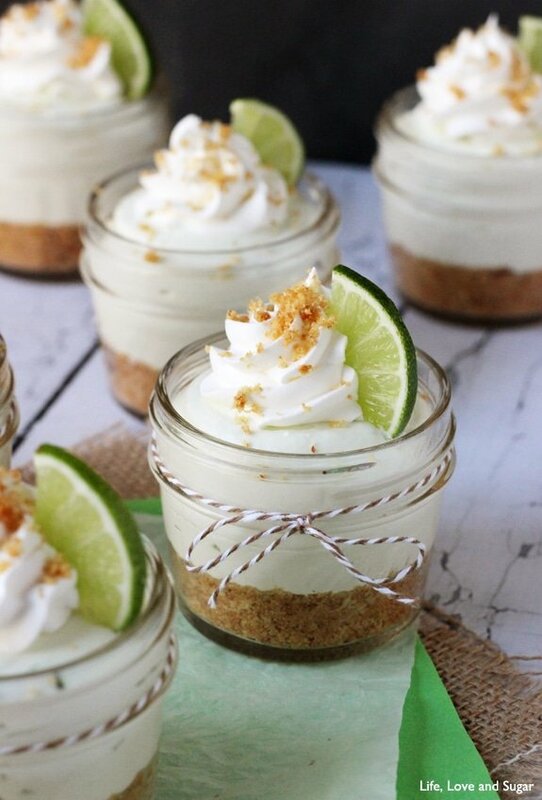 These No Bake Key Lime Cheesecakes in a jar are super fantastic! They are so incredibly easy to make and have the perfect key lime flavor – not too strong, but plenty key lime-y! Plus, today is an awesome day! Myself and about 20 other bloggers have come together to throw a surprise virtual baby shower for Lisa from Wine and Glue! One of the great things about blogging is meeting other bloggers and becoming friends. They can be so super supportive, it’s really amazing and has quickly become one of my favorite parts. I haven’t actually met Lisa in person, but I just love her and her blog! And I hope to meet her in person one day! Reading her story about her last child, Elliot, absolutely touched me. Warning, you may need tissue. My younger brother and I were both born with potentially life threatening conditions and our stories could have been so different. So I am super excited for her and her family to welcome their latest bundle of joy – a girl! 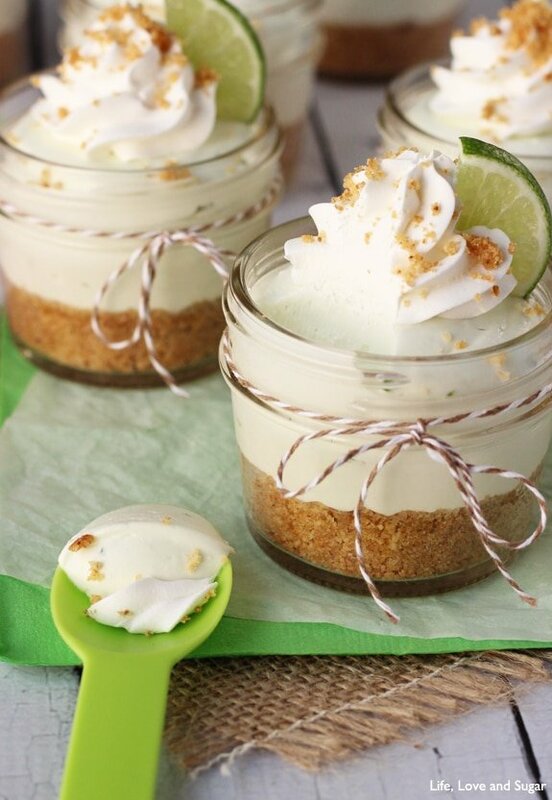 To celebrate, I brought (virtually, of course) this No Bake Key Lime Cheesecake in a jar. When attending baby showers, or any event with food really, I like to be able to taste everything. It’s just what I do. You know you do it too. And since we all taste everything, I decided to make it a little easier on us and make these cheesecakes in little mini jars. Aren’t they super cute?! I’m seriously in love. And they are so easy to make! Gotta love no bake treats. Seriously. All you have to do for the crust is mix together a little butter and graham cracker crumbs. Did you know you can buy graham cracker crumbs already crumbled? Before I started blogging, I had NO idea! It’s true and it makes this dessert even easier. I used the end of my muddler to press them into the bottom of the jars. If you decide to do that, don’t pack it in too hard or it will be hard to scoop out. I don’t speak from experience or anything. 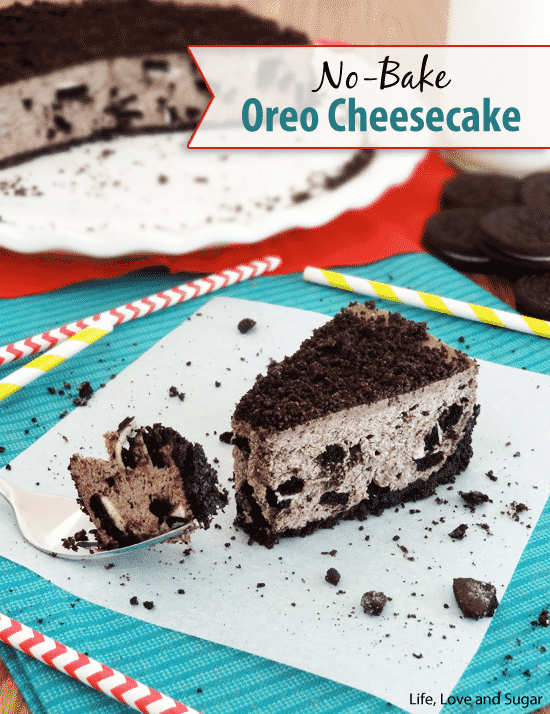 The filling is basically a smaller batch of the filing used in my No Bake Oreo Cheesecake. Minus the Oreos of course. Plus key lime. You get the picture. The usual suspects are included – cream cheese, sugar, key lime, Cool Whip, a little food color. Mix ’em all up and pipe, or scoop, it into the jars. Pipe a little whipped cream on top and a quarter of a slice of a key lime and you the cutest looking dessert ever! And if you’re wondering where to find these super cute jars, mine are from WalMart. They are the dry herb jars. They’re the same size as the jelly jars, but without the quilted pattern on the outside. They come in packs of 4. Pretty inexpensive too. So be sure to make these, and be sure to check out all the other awesome recipes being shared for the shower today and help us celebrate! Oh and I almost forgot! I’ll be guest posting for Lisa while she’s away on maternity leave from the blog, so keep an eye out for that! 1. Combine graham cracker crumbs, sugar and melted butter. 2. Divide the graham cracker crumb mixture evenly among the six jars. Lightly press down to make the crust. 3. Mix cream cheese, sugar, vanilla, key lime juice and key lime zest together in a large bowl until smooth and well combined. 4. Gently stir in Cool Whip and green food color. 5. Pipe, or spoon, cheesecake mixture into the six jars. 6. Top with additional Cool Whip. 7. 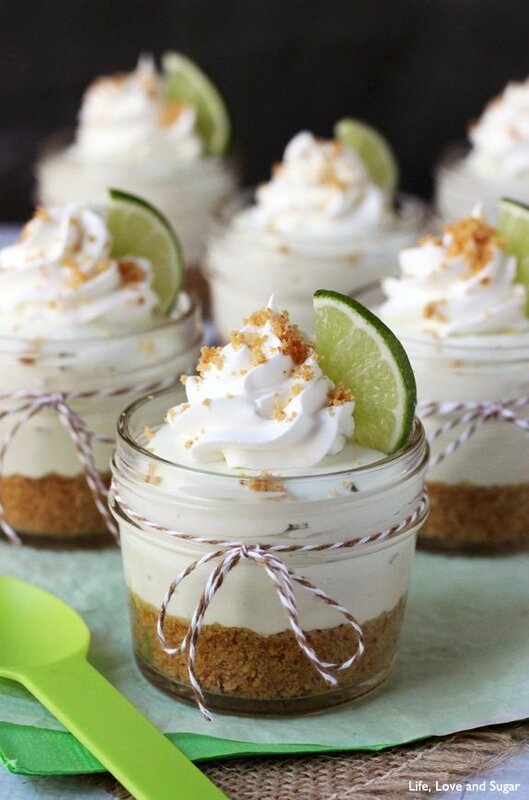 Garnish with key lime slices and graham cracker crumbs, if desired. 8. Refrigerate for about 5 hours or until firm. 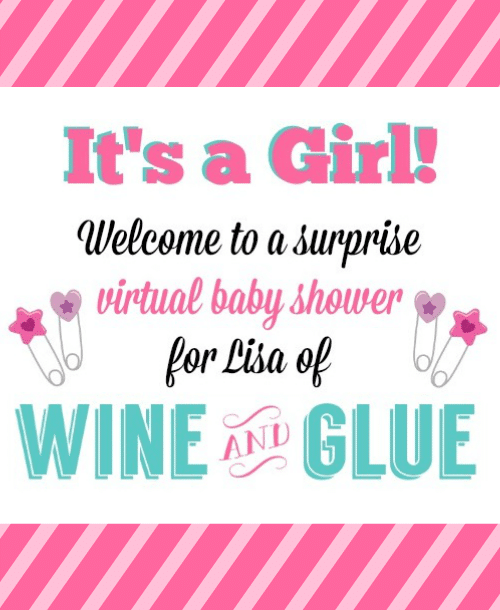 Please join us in celebrating a virtual baby show for Lisa of Wine and Glue. If you didn’t know already, it’s a girl! Lindsay, thank you so much!! You are too sweet! And I LOVE these cheesecakes! They are so perfect in their mini jars (I actually bought some jars just like this yesterday for the same exact purpose, lol!). I am so in love with the key lime flavor that this is PERFECT for me. Thank you!!! Thanks Lisa! I’m so glad you like them! How perfect that you just got the jars too! 🙂 Congratulations! Pingback: Strawberry Rice Krispie treats - Chocolate Chocolate and More! Thanks Heather! I’ve never had raspberry pie – sounds delicious! This is fabulous!! You must share your secret for perfect jar photos without glare. Pinned! Thanks Dorothy! I’m not sure I have a good secret – I had issues with the whipped cream being blown out – it’s so white! I don’t know if this is what helped the glare or not, but I put tissue paper up on the windows where I take pictures (usually, not all the time) to keep the sunlight from being too harsh. These are just fabulous Lindsay! I love all things mini and these are just too cute! These are adorable – I love those little jars! 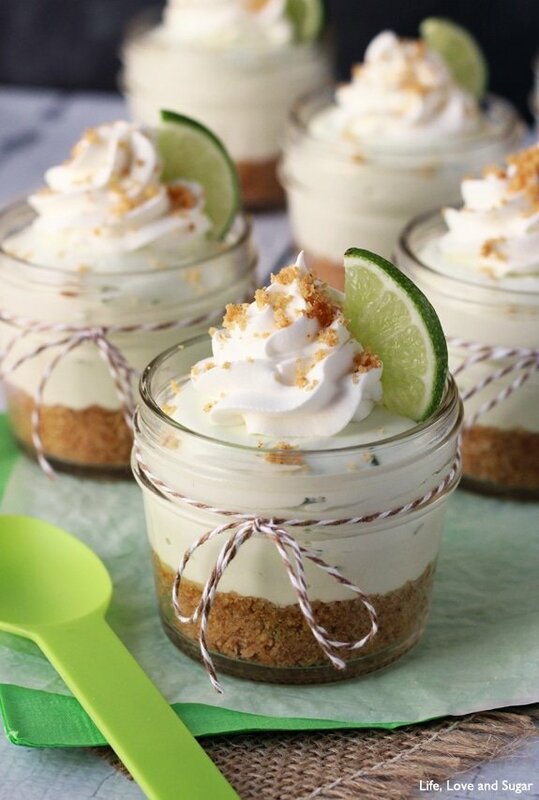 And the no-bake cheesecakes don’t hurt either : ) I’m on such a lime kick right now so these look perfect! 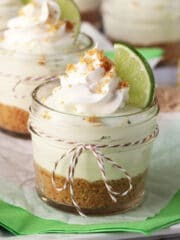 I have SUCH a weakness for Key Lime Pie AND Cheesecake! I need this in my mouth STAT!! Could these be any more perfect!? 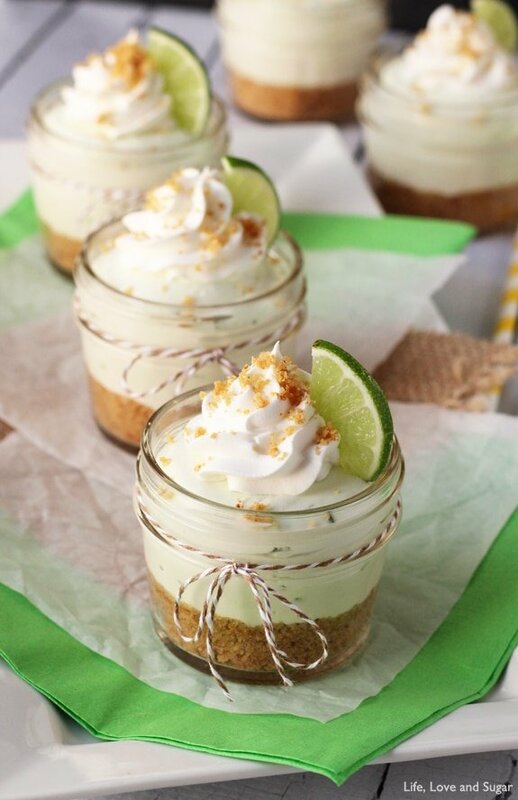 I love key lime, and everything is better in little jars! Thanks Holly! I love stuff in jars too – so fun! 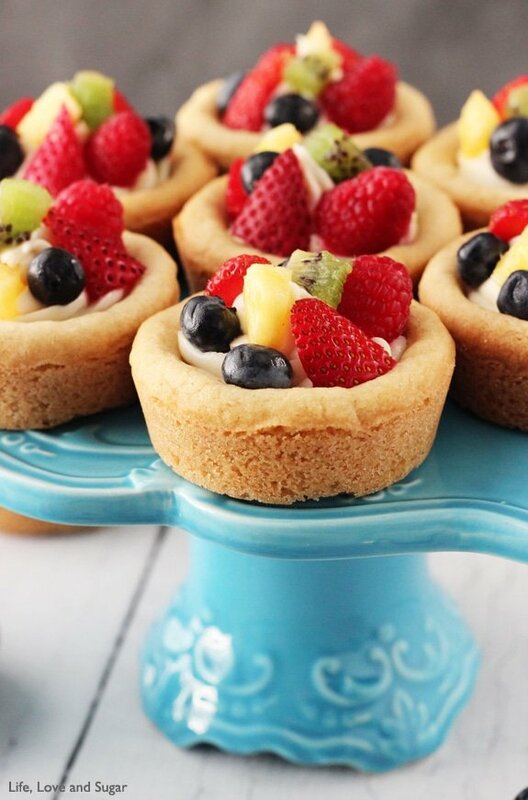 These cheesecakes look very elegant! 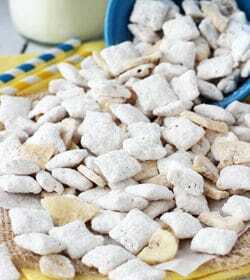 I make a similar recipe, but will try with key lime when we can find them in town. Great pics! Thanks! I love key lime! I love the idea of this. So cute and individual size keeps you from overindulging. Beautiful in every way! Pinning. Have a wonderful day Lindsay! Thanks Melanie! If only everything came in individual mini sizes. 🙂 Thanks for the pin! pinning now, making very soon. obsessed. 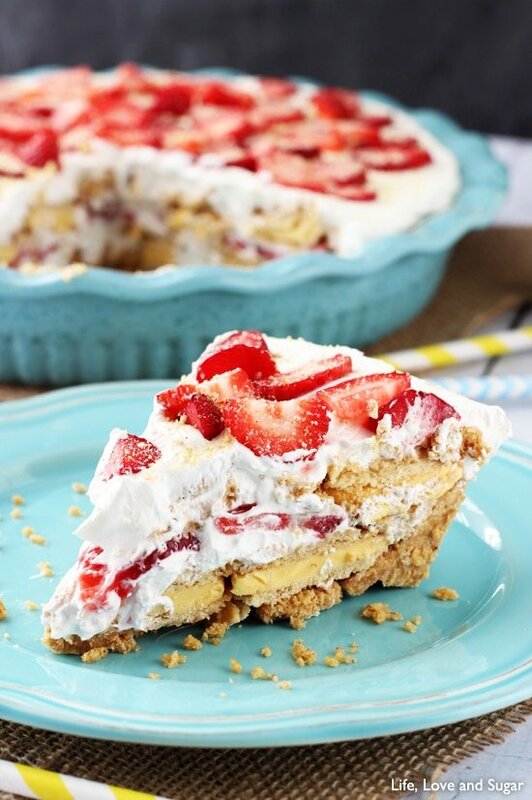 I am so glad you shared this recipe…it looks fabulously delicious! I can’t wait to try it…I know my family will love it! Oh MY! You are definitely in baby shower mode, Lindsay…when it rains, it pours, right?? 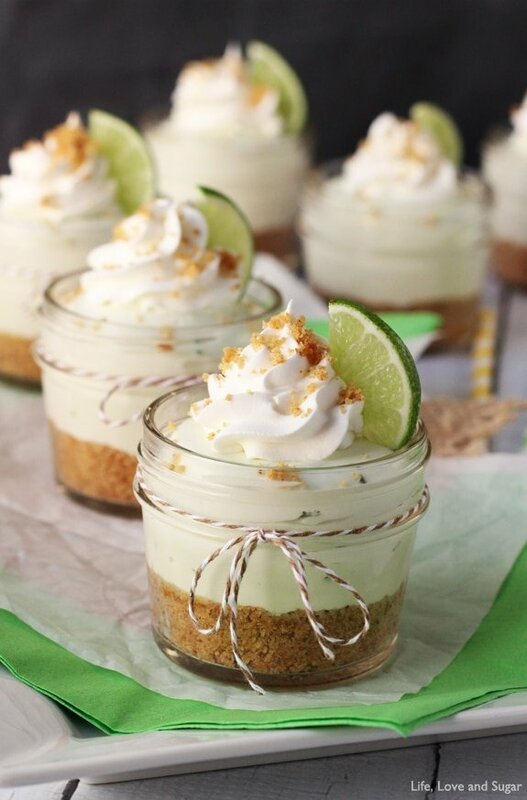 I LOVE these little cheesecakes – key lime is one of my FAVES – and I’m so happy I could celebrate Lisa’s soon to be new baby with you!! Oh yea, and there’s more to come! It’s just that time of life for us. 🙂 Thanks Cathy! Thanks for sharing with us at Marvelous Monday.. I love the idea of individual desserts! Pinned! 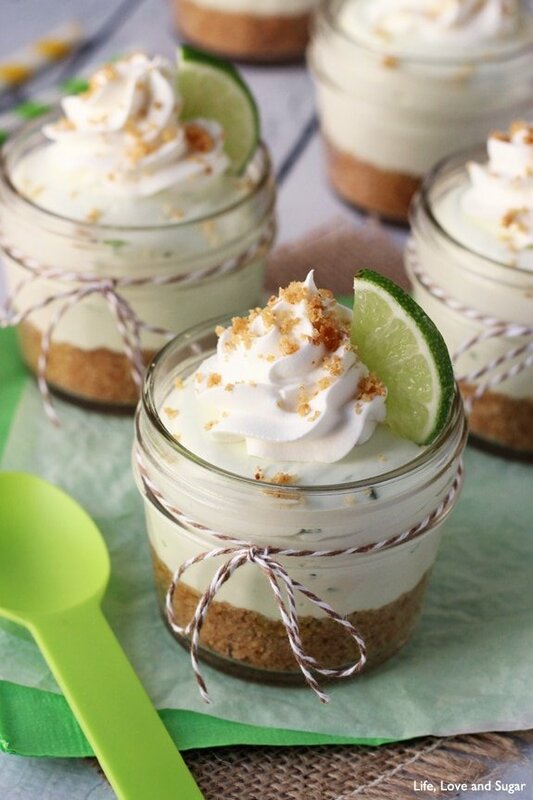 this looks so good, I love key lime and cheesecake, this is the absolute perfect summer dessert for a backyard bbq! Checking this out from the Tuesday talent show! I am planning to make this for an appetizer night….. it sounds delicious. I was wondering though…. I would prefer to make whipping cream versus using cool whip. How much whipping cream would you suggest to use? 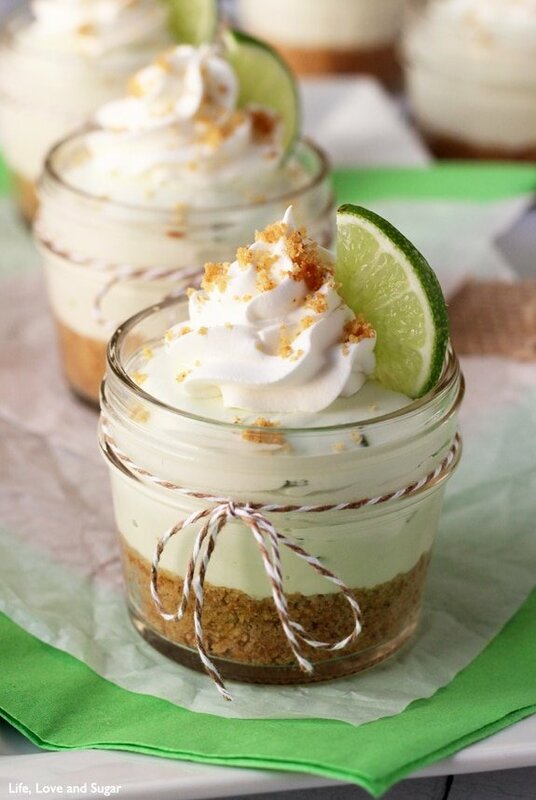 I was looking for a no-bake and delicious key lime cheesecake in a jar recipe… I found it ! 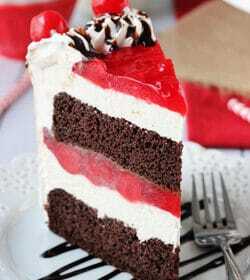 Will be baking this soon ! 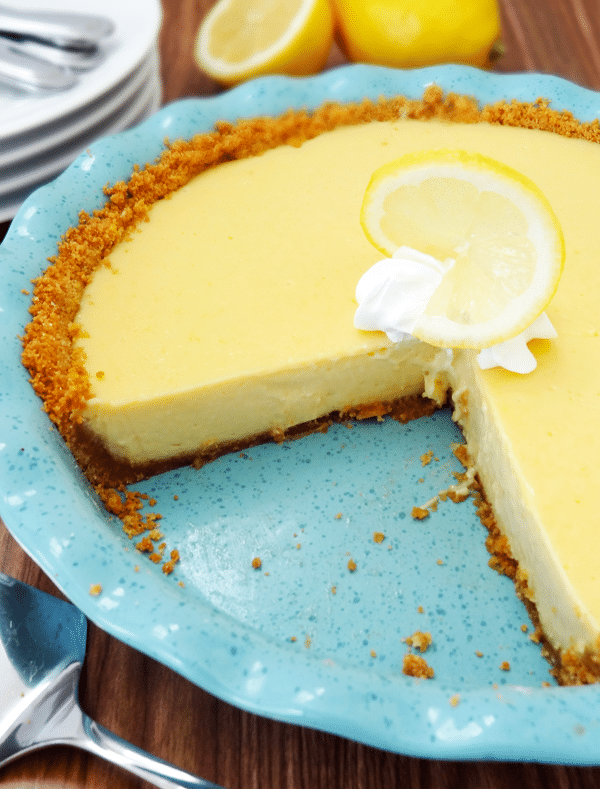 Could I omit the key lime juice and zest in the filling and would it be like an original (plain) cheesecake or do those ingredients need to be substituted with something else? I’m not a big key lime person and was thinking this would be great as an original cheesecake with strawberry on top. Yes, it should be fine like that. You could swap in a couple tablespoons of sour cream, if you like. I’d also raise the amount of vanilla extract to 1 1/2 tsp. I’d say 2-3 days is ideal. So cute – I love this so much! These look amazing! Can they be frozen and is it possible to use regular limes if key limes aren’t available? I would think freezing them would be ok. I just recommend defrosting in the fridge. And yes, regular limes would work just fine. I found it ! Will be bakinI love the idea of thisg this soon !